Fig. 1 Time variations of vortical structures. νjet = 0.08 and 0.10 cases compared. Fig. 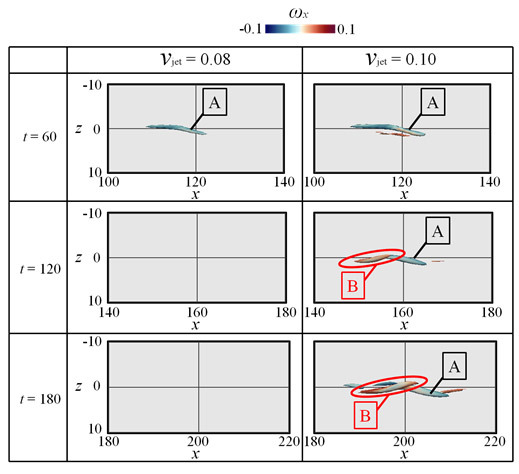 3 Velocity vector field with color map of streamwise vorticity in y-z plane at t = 80. Fig. 4 Key structures in laminar-turbulent transitions. 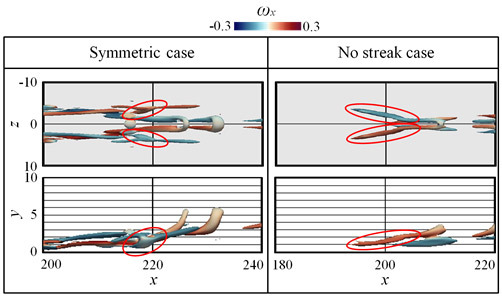 Symmetric blowing case and no streak case. Kachanov, Y. S., Physical mechanisms of laminar-boundary-layer transition, Annu. Rev. Fluid Mech., 26 (1994), 411. Schlatter, P., Brandt, L., DeLange, H. C., and Henningson, D. S., On streak breakdown in bypass transition, Phys. Fluids, 20 (2008), 101505. 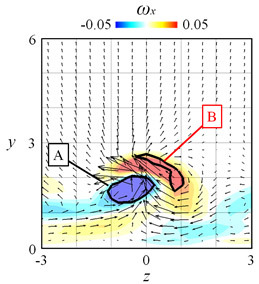 Levin, O. and Henningson, D. S., Turbulent spots in the asymptotic suction boundary layer, J. Fluid Mech., 584 (2007), 397. Cherubini, S., DePalma, P., Robinet, J.-Ch., and Bottaro, A., Edge states in a boundary layer, Phys. Fluids, 23 (2011), 051705.